On Wednesday, July 9, 2008, after the Senate convenes at 9:30am, it will resume consideration of the FISA Amendments Act of 2008 (H.R. 6304). There will be one hour and forty-five minutes of debate, with 30 minutes under the control of Senator Feingold; 15 minutes under the control of Senator Dodd; 10 minutes under the control of Senator Bingaman; 10 minutes under the control of Senator Leahy; 10 minutes under the control of the Majority Leader; and 30 under the control of the Republican Leader or his designee. Reid: At which time I will serve cookies and also juice. Only one cup per Senator will be passed out at cookie time. Please don't spill any juice, the floor of the Senate is very hard to clean up. Upon the use or yielding back of this time, the Senate will proceed to roll-call votes in relation to the pending amendments. Upon disposition of these amendments, the Senate will proceed to a roll -call vote on the motion to invoke cloture on H.R. 6304, as amended if amended. If cloture is invoked on H.R. 6304, all post-cloture time will be yielded back, and the Senate will proceed to a roll-call vote on passage of H.R. 6304, as amended if amended. Reid: I want to make sure that all Senators be sure and get a permission form for all these events, I know we have had a problem with parents not providing the proper paperwork, I want to be clear that won't be tolerated anymore. Hall monitors will be watching and I expect a full report. The Senate will soon vote on a FISA bill that represents the final result of negotiations among the White House and Democrats and Republicans in Congress. I opposed the version originally passed by the Senate. And although improvements have been made in the version now before us, this legislation continues to contain provisions that will lead to immunity for the telecommunications companies who cooperated with the Bush Administration's illegal warrantless wiretapping program. For that reason, I will vote no. 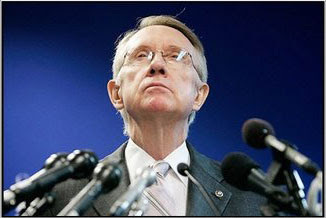 Reid: Especially considering that I have made sure that this bill will pass. I want to maintain the illusion that I am something other than a tired sell out that is well past his prime and care more about maintaining the democratic kindergarten that I have submitted to under the republicans low these many years. I have learned to like the taste of boot leather. Geez what a coward, what a sad end to a fairly decent career and a even more sad end to the central role of the Constitution in our government.